My (then) boyfriend’s parents refused to let me into their home, solely because I was visually impaired. At that point, my world fell apart. I was born with a condition called aniridia. This means the colored part of my eye (the Iris) is absent. The severity of aniridia varies from person to person. In some people, the condition affects only one eye and they are able to drive. For others, it can lead to total sight loss. Because of aniridia I’ve been severely visually impaired all my life. Even so, when growing up I had enough vision to do virtually everything my friends could do. Although I had little support in my lessons, I went to mainstream schools and could join in all the activities. I was happy in school and made lots of friends who remain my friends to this day. Communication has always been my passion. As a child, I pretended objects like egg whisks and large spoons were radio microphones to “interview” family members! Before going to sleep, I preferred listening to a local phone-in radio program to a bedtime story. Once I fell asleep I dreamed of hosting my own show. So it was no surprise when I went to university, I studied Radio Broadcast Communication. I spent my early university days in Cardiff, South Wales. Since Cardiff is several hours drive from home, I lived away from home for the first time. I never thought my visual impairment would be a barrier to independent living and I loved my new way of life at university. However, when the chance for a year’s exchange to Western Carolina University in the USA came along, my sense of adventure went into overdrive! While my parents were always supportive, they were nervous about me living on the other side of the world. They could have tried to stop me, but I’m so glad they didn’t. I literally had the time of my life in Carolina. I made friends from all over the world, hosted the breakfast show on the local FM radio station, and ultimately became the station manager. Such was my love of life in the Great Smoky Mountains. What began as a one year exchange ended up as three years and I graduated from WCU. After graduation, I got a job as a drive-time host at a commercial radio station in Michigan. I felt unstoppable! When my visa expired I returned to the UK. After I returned home, routine hospital checks identified conditions often associated with aniridia were starting to affect me. I developed glaucoma, cataracts and corneal problems which needed treatment to avoid further sight loss. The reality of finding a job in the UK as a visually impaired person, combined with newly diagnosed issues was challenging. The latest news concerning my sight, affected my confidence, my mood, and my sense of self-worth. Although I’d always presented myself as a positive, happy person, the truth was more negative thoughts were never far from the surface. These feelings grew, when, for the first time in my life, I experienced rejection. 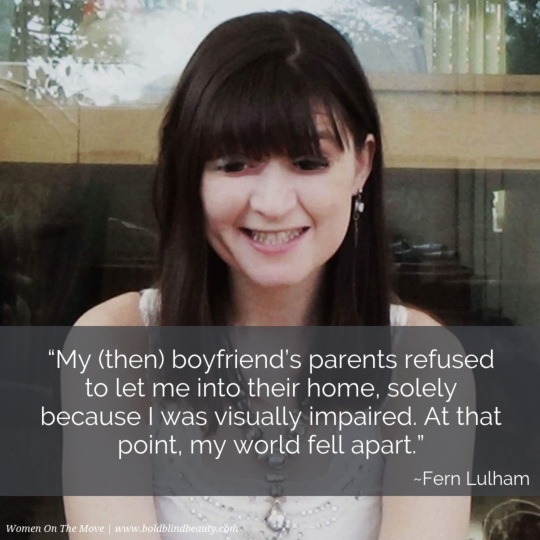 My (then) boyfriend’s parents refused to let me into their home, solely because I was visually impaired. At that point, my world fell apart. Despite the fact my sight worsened as I’ve got older, one of my guiding principles is always to have hope. Thanks to this principle I’ve carried on; found a job, stayed involved with radio, and pursued a public speaking career. I’m now President of Eastbourne Speakers Club, part of Toastmasters International and I use my skills as a speaker to inspire others. Encouraging them to never to give up hope and to value the person they already are. I am passionate about becoming more influential in the area of mental health and have a youtube channel devoted to the subject. I am so lucky to be surrounded by positive, supportive people. One of these is my Consultant, Mr. Samer Hamada. In November, I am due to have stem cell surgery carried out by him. If this is successful, it might slightly improve my vision, or it might just prevent further sight loss. Either way, it contributes to the feeling of hope for my future. Like so many others, I have dark days – days when it would be so easy to just give up. But I won’t give up. I have the love and support of others and hope in my heart. Hope that my best days are ahead of me! In this photo, Fern is standing at a lectern at a speaking event. She is wearing a dark-colored cold shoulder dress with a silver necklace and ankle boots. Fern is posing in this photo wearing a sparkling lacy red dress with her consultant, Mr. Samer Hamada. I love reading stories of overcomers like you! You give us all hope. I love this story but am saddened by two things. The matter of being turned away speaks for itself and has happened to me. I’m wondering, though, why Fern left the U.S. Her Visa expired. Did the U.S. also turn away this bright, working, productive lady? I couldn’t really say the US turned me away, but getting the right to stay and work there involved an expensive legal process with no guarantee of success. Thank you for your comment. I wonder what will happen to these parents when they become, old, infirm and need help. I know for sure they will expect assistance. Yes, I don’t understand what they were possibly thinking. I feel sorry for them.